1. 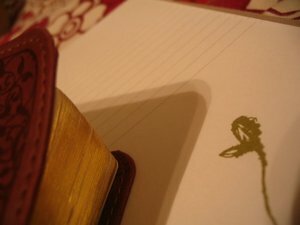 To give these two possessions more attention: my Bible and my journal. 2. To improve my posture. 3. To look back on December 31, 2006 and say I am healthier today than I was a year ago. Happy New Year Molly. I love the improve your posture one, how original. I hadn’t thought of it till now, but that’s an excellent thing for me to work on. My form seems to have morphed into the shape of someone being hunched over a sewing machine. Your list is very positive, great way to start the year. I was going to say that you only had three things when you said there would be four… then I thought that would be silly – oh dear!